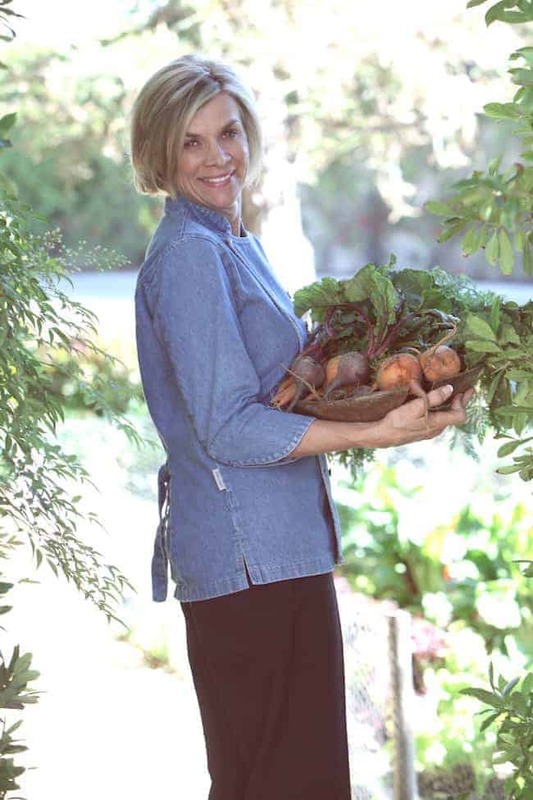 You might have seen Paulette Lambert as a nutrition expert on ABC’s Extreme Makeover: Weight Loss Edition or The Dr. Oz Show, but she’s also the California Health & Longevity Institute’s Director of Nutrition. 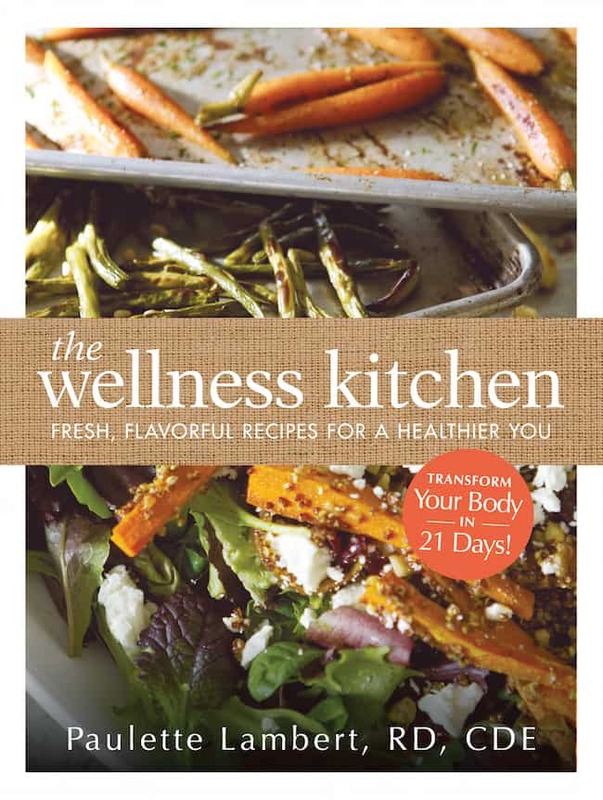 The registered dietitian and certified diabetic educator has also just published The Wellness Kitchen, a beautiful (and easy-to-follow) 21-day guide to eating and living healthier. 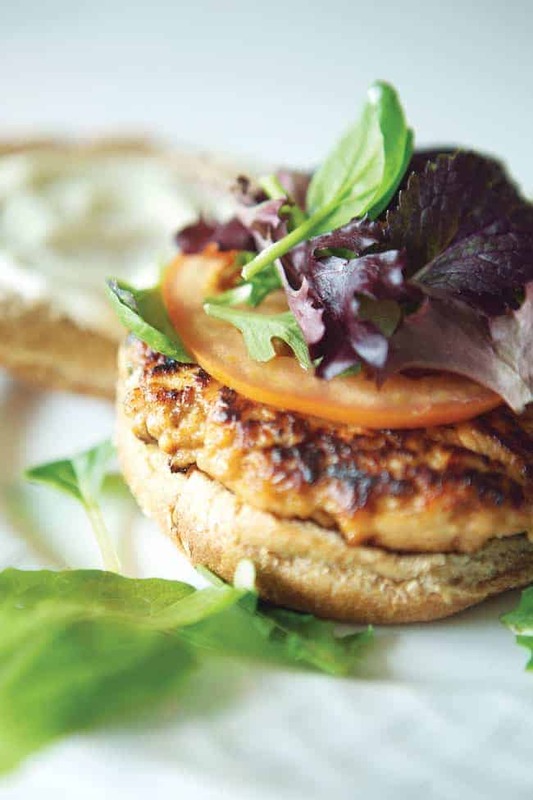 We asked Paulette for some of her healthy-eating tips, and you can get her super-delicious Hoisin Salmon Burger recipe below—it’s an amazingly tasty healthy dinner. You mention in the book that you’re surprised that people assume it’s difficult and time-consuming to eat healthy food. What do you think are a few of the most common misconceptions about healthy eating, and how would you debunk them? The most common misconception is that it won’t taste good. Eating healthy does not mean that you can’t use small amounts of healthy fat, salt and sugar to enhance the flavor of food. For example, our roasted balsamic strawberry recipe uses 1 tablespoon of sugar per serving (a total of 54 calories, approximately 13.5 calories per person), which creates a wonderful caramelized flavor. Another misconception is that it’s too costly. This is not true if you buy seasonal produce, frozen fruits and vegetables, less expensive cuts of meat and whole grains. These can be found inexpensively in all markets. Controlling our portions of protein also cuts price down. For example, a pound a ground turkey should feed 3-4 people, not 2. Some vegetarian choices, such as beans and lentils, are a great way to balance out the food budget and are a great source of protein. Whole grains can be bought in bulk and are less expensive then the refined counterparts. A box of old-fashioned oatmeal is far less expensive per serving than a box of processed cereal. What are a few of your favorite healthy-eating shortcuts? Roasted veggies in an oven can take 30-45 minutes. By pre-cooking them in the microwave, then putting them on the baking sheet with a drop of olive oil, you can cut the cooking time down in half. You can use your microwave to make homemade oatmeal in 3 minutes; cook quinoa in a bowl for 10 minutes and, voila, you’re done. Cook poached chicken in broth on the stovetop for 10 minutes – you now have moist chicken to use in soups, salads or pastas. Make up your own baggies of almonds and dried fruit for healthy, on-the-go snacks. To avoid going to the market more than once a week, stay organized. Take a sheet of paper and write down the meals you want to make that week, and then prepare your shopping list of ingredients. Prepare your more perishable foods at the beginning of the week. What are some of the best (and easiest) ways to get kids in the healthy-eating mindset from an early age? Introduce healthy food. When transitioning from baby food, serve only healthy food in your home. Kids learn from their parents and will eat what is available. The message to children should be that we honor our bodies by eating good food. Also, we honor the planet by eating less refined processed food. If you take good care of your body, you take good care of the planet. Your meal plan is 21 days—what’s the rationale behind that time period? The 21-day meal plan is a jump start into healthy eating. While research tells us it takes 66 days to change a habit, the 21-day jump start is enough time to make some adjustments in your eating habits and short enough time to not be overwhelming. Twenty-one days is not enough to lose any large amount of weight, but you’ll look and feel better. Look at it as a period of time to re-evaluate what works and what doesn’t, to make new goals and continue on. Besides weight management/loss, what are some of the most important wellness incentives for eating this way? Gaining more energy. A healthy diet makes you look beautiful from the inside out, such glowing radiant skin and hair. Another benefit is prevention of premature chronic disease. You can be healthy at 90 but the earlier you start, the better. A healthy diet can actually prevent and reverse most of the premature chronic disease. What does your typical day look like, wellness-wise? Before you reach for another pound of ground beef or turkey, switch it up with fresh salmon to create a seriously delicious burger with an Asian twist! Combining fresh salmon with ginger, garlic, a touch of hoisin sauce, and cilantro creates a flavorful burger that will make even the most discriminating burger lover very happy. My family loves the ginger aioli with extra heat, but you can adjust the Asian chili paste to suit your taste. This burger pairs well with baked sweet potato fries tossed with a sprinkle of lime juice and sea salt. Preheat broiler to medium-high and set the rack 4" from heat source. In a food processor, pulse the salmon 3–4 times, just enough to rough chop, not puree. Make sure not to overprocess the salmon. Place chopped salmon in a medium bowl and add cilantro, hoisin sauce, garlic, . teaspoon ginger, salt, pepper, and panko bread crumbs. Mix well. Form chopped salmon into 4 patties. Place on a sheet pan lightly coated with cooking spray. Cover and refrigerate if using later. Make the ginger aioli by whisking together the mayonnaise, Asian garlic chili paste, lemon juice, soy sauce, and remaining ginger. Place salmon patties under broiler for 3–5 minutes on each side, or until just opaque. To serve, place each patty on a whole-wheat bun and top with 1 teaspoon of ginger aioli. Top with baby greens and tomato slice. For those who need to limit carbohydrates, eliminate the bun and serve with a side of baked sweet potato fries, which are high in fiber and lower on the glycemic scale. For those who need to limit carbohydrates, eliminate the bun and serve with a side of baked sweet potato fries, which are high in fiber and lower on the glycemic scale.Excerpted from The Wellness Kitchen Copyright © 2015 by Westlake Wellbeing Properties, LLC and published by F+W Media, Inc. Used by permission of the publisher. All rights reserved. Photos courtesy of Harper Smith Photography, Daydreamer Productions. Cover design by Frank Rivera. This recipe looks very delicious. I am planning ti have a new recipe for weekend, and I think I just have decided what to cook after reading this. The ingredients itself is very healthy,especially salmon. Thanks for this! Great topic! I’ve actually never had a salmon burger but I am pretty interested in trying it out! Will keep it in mind for this weekend! I am just obsessed with how delicious this salmon burger looks and sounds. I definitely will be making the recipe. Pinned!